The diagnosis experience of people with type 2 diabetes can vary quite significantly. Some people are given a good introduction to what type 2 diabetes is and access to well run diabetes education courses. However, we’re aware that some people newly diagnosed with type 2 diabetes have been given a prescription for tablets and been told to get on with it! Our guide here provides important information as to what type 2 diabetes is and how you can get on top of the condition and start controlling it at an early stage. Type 2 diabetes is a condition which develops if your body can no longer respond effectively enough to its own insulin to prevent your blood glucose levels from going too high. The good news is that you can fight back against this and get your body to respond better to insulin. Our Low Carb Program shows you how you can achieve this and, since we launched it in 2015, many thousands of people have improved their ability to control their diabetes. Diabetes can be a tough condition to accept but the good news is that it is a condition which, with a bit of dedication, can be well controlled. The Diabetes Forum has thousands of posts from people with type 2 diabetes and there is no better place to find support and share your experiences. If you are finding the diagnosis of type 2 diabetes to be a shock, or are struggling to come to with your diagnosis, read our guide on accepting a diagnosis of diabetes. 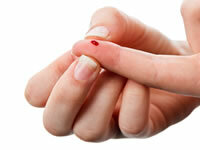 It is relatively common for people with diabetes to be also going through a period of depression. Read more about coping with diabetes and depression. Knowledge is one of the best tools for managing diabetes. For this reason, there are a number of structured education courses that have been set up to help us understand and manage our diabetes. In some cases, your GP may offer you the chance to enrol onto a structured education course whereas others may need to request their GP to enrol them onto a course. Note that availability of places on these courses may sometimes be limited depending on the level of demand and number of educators. For additional and immediate guidance, join our Low Carb Program which provides a step by step approach to diet that has made a huge difference to the many people that have followed the course. The treatment options for type 2 diabetes can range from ‘lifestyle changes’ treatment to taking tablets or injections to help control the condition. The type of treatment you receive can sometimes depend on how early diabetes has been diagnosed (the sooner the better) and how to resistant to insulin your body is. Our diet is a key factor that affects our blood sugar levels and using diet changes to our advantage can be a good way of bringing type 2 diabetes under control. If you are overweight, losing extra body weight can improve your body’s response to insulin and this helps to lower your blood sugar levels. You will receive a blood test called an HbA1c test at regular intervals which will allow you and your doctors to review how well controlled your sugar levels are. However, to get a detailed understanding of which factors and foods affect your blood sugar levels, and by how much, home blood glucose testing is a very useful tool. See our page on controlling type 2 diabetes for how blood glucose testing can be used to build an understanding of your diabetes and improve blood glucose control. For a complete list of the checks see our guide to diabetes health checks.